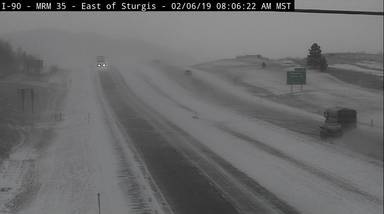 I-90 near Sturgis shows winter weather conditions Wednesday morning. STURGIS, S.D. - Another shot of snow and bitter cold have descended upon South Dakota Wednesday. The National Weather Service has a Winter Weather Advisory in effect until Thursday morning for most of Western South Dakota. The only exception is extreme northwest South Dakota. Forecasters say the strong weather system will continue to cross the Northern Plains today and tonight and generally bring 2 to 5 inches of snow to the area. The highest amounts are expected across the southern Black Hills and across the plains east of the Black Hills. Some blowing and drifting snow will be possible across the South Dakota plains as well. In addition, very cold temperatures combined with northerly winds will produce life-threatening wind chills through Thursday morning, especially across northwestern South Dakota and northeastern Wyoming. Safe Travel USA reports I-90 in western South Dakota has some ice and snow cover and slippery spots and visibility is poor in some areas due to blowing snow.